Advanced manufacturing isn’t limited to specific industries. It can incorporate emerging technologies, but it’s not just about innovative equipment either. According to a report from the President’s Council of Advisors on Science and Technology, advanced manufacturing is “composed of efficient, productive, highly integrated, tightly controlled processes.” Does that describe your surface finishing and deburring operations? If not, would you like to apply advanced manufacturing principles to these tasks? 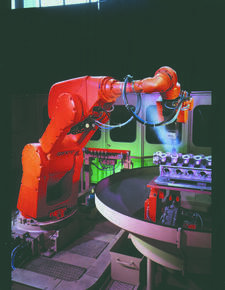 Advanced manufacturing harnesses the power of automation, and that means industrial robots and CNC machinery. Flex-Hone® tools and NamPower brushes from Brush Research Manufacturing (BRM) work well with both types of equipment. In fact, Flex-Hone® tools are suitable for most any rotating spindle. NamPower technology such as NamPower nylon abrasive disc brushes and tool holders are easily integrated into CNC machine centers, transfer lines, and robotic cells. Flex-Hone® tools are flexible, resilient honing tools with a soft cutting action. Their abrasive globules or “balls” remove burrs and improve surface finish at the same time. BRM ball hones, as these American-made tools are sometimes called, are designed for inner diameter (ID) applications. Use them to deburr, deglaze, and surface finish cylinder walls. Flexible hones are also great for removing burrs from cross-drilled holes. In addition to cross-hole deburring, Flex-Hone® tools are used for chamfer blending. Diamond Flex-Hone® tools are ideal for harder materials such as aerospace alloys, carbide, and hardened tool steels. Industries such as aerospace and defense don’t have a monopoly on advanced manufacturing, but Flex-Hone® users in both these sectors use BRM’s diamond tools as part of tightly-controlled, quality-driven processes. For manufacturers of engine cylinders and other components that require lubrication, the type of surface finish that flexible honing imparts is especially important. Oil-retaining grooves optimize lubrication and promote piston ring seating and sealing. Parts that are free of cut, torn, and jagged metal are less prone to misalignment. At the same time, automated deburring and finishing improves operational efficiency. NamPower nylon abrasive disc brushes also support advanced manufacturing. To produce maximum burr removal rates and optimum surface finish at the same time, these industrial brushes feature a combination of ceramic and silicon carbide abrasive. Depending on the degree of surfaced improvement that’s required, manufacturers can choose from four grit sizes. There are two different brush types. Dot-style NamPower disc brushes are ideal for lighter-duty deburring, edge radiusing, and surface finishing applications. Turbine-style NamPower disc brushes are designed for medium to heavy-duty applications. Both types of nylon abrasive brushes are available in various sizes, including small-diameter NamPower tools that are great for harder-to-reach areas, smaller parts, and planetary head mountings. Lightweight tool holders for NamPower abrasive disc brushes promote brush tool life and put less stress on machine bearings. Because they’re made of highly-damping carbon fiber, these NamPower accessories also reduce spindle vibrations. BRM’s lightweight tool holders support flow-through cooling systems, too. This reduces heat generation, which allow NamPower disc brushes to run at greater cut depths. If you’re interested in advanced manufacturing, SOUTH-TEC is a great place to learn more. This year, the Southeast’s premiere manufacturing event is scheduled for October 27 to 29 at the Charlotte Convention Center in Charlotte, North Carolina. Visit BRM in Booth #1643, and maximize your time on the tradeshow floor by requesting a meeting in advance.